“…this giant leap is the best one Scott could hope make at this stage in his career and, indeed, the right one for mankind to feast on”. – I really dug this line, man! Great way to open your review. A great read overall and it makes me all the eager to this. Cheers! Ha! I didn’t even notice that. I did, however, just notice a missing “more” from my comments… “All the (more) eager…” Haha! Even the best of us make mistakes, right? Haha! Only the best! 😉 heehee! Always great to see a strong addition into the science fiction realm. Couldn’t agree more Alex, love this genre. I echo Alex’s sentiment. Wonderful review. “Stuck on Mars”. Can’t say I’ve ever wanted to, but I’m looking forward to it. Thanks Cindy! Hope you enjoy the film if you get around to seeing it. Good review. It’s a very fun and energetic movie, but at the dead center of it, still has a heart to work with. Exactly, which makes it so endearing and palatable. Cheers Dan. Really well written buddy. Saw this earlier today and loved it. What a great ride! Thanks mate! Ah that’s great — I always like it when a really good film gets the unanimous praise it deserves. Ditto that! 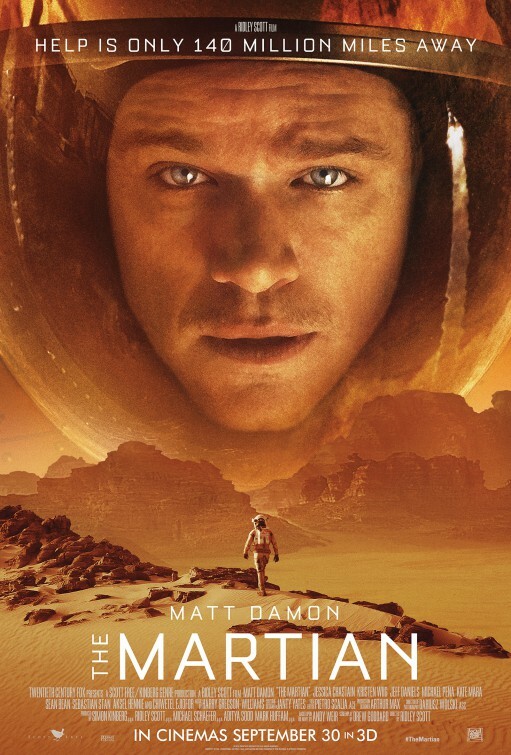 Mark Watney’s attitude makes the movie absolutely hurtle by. This is one of the most optimistic movies I’ve seen in years, what a great one. Thanks mate! Right? 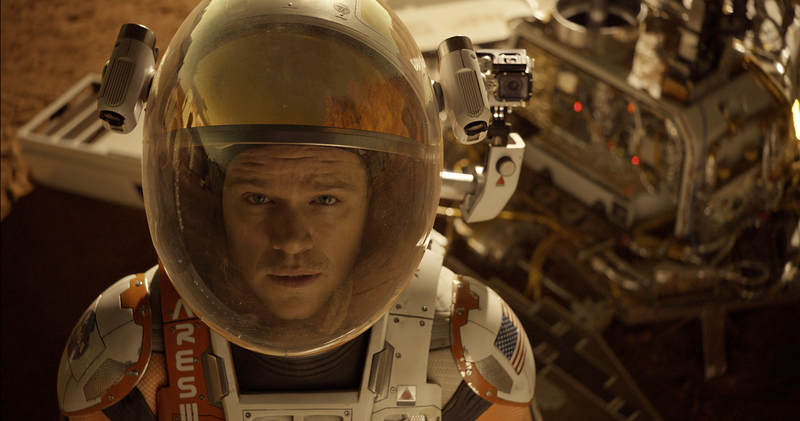 Watney’s optimistic attitude working in tandem with the overarching positivity affords the film real heart and soul. Time exceedingly well spent. I just finished reading a review of it on Jordan & Eddie and the point Eddie made really took me aback, I couldn’t believe I didn’t notice it before, but this is easily Scott’s most uplifting movie. He typically likes to keep his actors in dark and dramatic roles, and if comedy does arise it’s usually (and quickly) dispensed with in an ensuing crazy scene. The Martian, by comparison, feels like a comedy. It’s a really well-judged movie. And risky at that! Great point, totally agree. Alien, Blade Runner, and Prometheus are all pretty dark, weighty movies and the characters generally go through the wringer. Watney does go through the wringer here, but it’s under the guise of a brighter, more hopeful tone. I’m really glad Scott has made an uplifting sci-fi movie — now he can’t get tagged with that ‘moody director’ tag. The extended cast really does a good job of proppping up Matt Damon. In the book it’s all about the martian, but it’s nice to see the movie flesh out some of the earthlings as well. Great write up mate. I wish I could agree with your sentiments, but great post nonetheless! Thanks Jordan. Ah that’s a shame! it was too feel good for me. That and the comic elements of it hit a false note for me. It sure looked amazing though. I totally agree with you on this Jordan. It was really entertaining movie, excellent on all counts, but one, I too felt, that the overused comic, feel good elements, made it unrealistic and basically flawed what otherwise could have been a really great, great movie. Yes, you are spot on and correct Jordan, thanks. Having worked in the movie distribution business, for around 35 years in South Africa, I think I have watched enough movies to get a feel for this sort of thing. However, film distribution is, is not film production, so I say this, with all respect for the film makers and Director, as to be absolutely objective, I would need to put myself totally in their shoes and be able to do a better job of it, which I obviously could not do. Therefor a thumbs up to them anyway for this entertaining entry. Interesting points guys. I was completely won over by the film’s decision to be generally upbeat, but I can see where you are coming from. Perhaps, as it won the Golden Globe in the best comedy/musical category, my opinion may be a bit misguided, if of course the film makers intended it to be a comedy, opposed to dramatic sci-fi, as it was clearly not a musical, (although, I must say, that I really loved the music, but perhaps that is just my age showing again 🙂 ). Anyway Adam, it was a really entertaining movie, whichever way one looks at it and I certainly understand and respect your point of view on being won over by it being generally upbeat, even if I would have preferred it to have had (as Jordan put it), a dark, gritty edge. It’s just one of those things — I’m not a huge fan of The Imitation Game (solid film, good performances, but a bit bland). I trust you are not feeling so alone in your views on this anymore Jordan. 🙂 All the best. Cheers, Ivan. Excellent review! This was definitely worth the watch and a return to form for Scott, but I feel that it was immensely flawed at the best of times, too, and that a wonderful supporting cast was quite wasted. It was visually stunning to look at, and I loved watching Watney on Mars, and I adored his geeky humour. I actually thought the screenwriters handled such a large cast pretty well, but I can see your point. Watney is the type of guy you’d love to have around on your darkest day — his ironic humour could turn any grey sky blue. Cheers Zoë!